Jensen's public association with music goes back to his time in Days of Our Lives when he recorded a song for a cover album featuring the stars of the soap opera. Later in the Dark Angel episode The Berrisford Agenda, Jensen learned a Chopin piece for piano that his character Alec had to play. Although it had been planned to use shots of a professional musician laying the piece, Jensen's playing was so good they also used it in the final cut. At Asylum Europe 2 Jensen talked about learning the piece. He also mentioned that when he was growing up, his mother played the piano, and his father played the guitar, which was the instrument Jensen preferred. 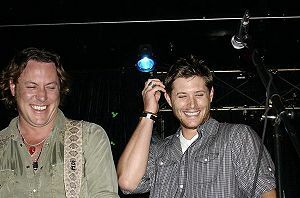 Jensen counts a number of musicians amongst his circle of friends - Jason Manns, Steve Carlson and Christian Kane. Jensen's first musical outing during his time on Supernatural was at his very first convention - Asylum 2007. On the show, Dean's broken out in song on a number of occasions - the joke being that Dean is a terrible singer. For more on Dean's musical tastes see this article about the music of Supernatural. Fangasm report about collaborating with Steve Carlson and Jared filming the video, from his Meet & Greet at Salute to Supernatural Dallas 2012. At the Salute to Supernatural L.A. 2011, Jensen and Jason gave a private jam session for around forty fans. Tickets, through silent auction, were around $1500. Since 2013 when Louden Swain started performing at conventions between the guest panels, spontaneous performances by Jensen during his panel or the Saturday Night Special Concert have become a regular highlight. Jensen singing "Sister Christian" at Salute to Supernatural Las Vegas 2015. Jensen singing "Simple Man" at Salute to Supernatural Vancouver 2015. Corey Taylor from Slipknot and Jensen cover "Dead or Alive" at VegasCon! Watch the official Creation video. In addition to their convention eprormances, Jensen has recorded with Jason Manns. In 2014, Jason recorded an album Christmas with Friends on which Jensen sings "Have Yourself a Merry Little Christmas". On Christmas Eve that year, Jensen joined Jason for a streaming Stageit concert, filmed at Jensen's home in LA. 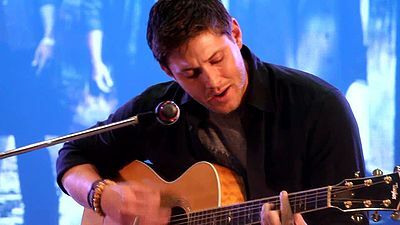 Jensen sang harmonies on "Come around more Alabama" (Spot in the Corner), as well as backing vocals on "Hummingbird Billy", "Rocking Chair" and "Wasted Jamie" (Rollin' On). Jason Manns supported Jensen's backing vocals on "Rollin' On". Jensen helped co-write two songs on Steve's April 2008 record, "Stripped Down", namely "Where my River flows" and "Love you or leave you". Kane - the band fronted by Christian Kane and Steve Carlson - have played an number of gigs at Dante's in Portland, Oregon, where Chris's series Leverage films. On June 28, 2009 Jensen and Danneel joined Leverage co-stars Tim Hutton and Aldis Hodge to celebrate Chris' birthday. 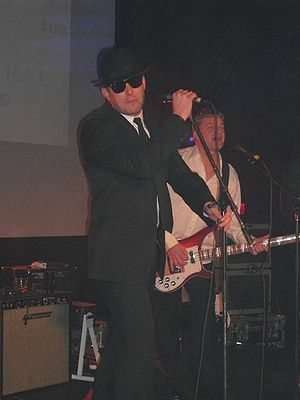 Jensen joined the band on stage for a few songs including "Happy Birthday". Steve did an online Stageit concert on 31 Aug 2011 and said the guitar he was playing belonged to Jensen. Danneel posted a photo on twitter of Steve and Jensen playing together. Steve did an online StageIt concert with Jonah Dolan on 27 November 2011 and near the end Jensen joined them by playing the guitar. Jensen sang lead vocal and played guitar while Steve played mandolin on the song "Angeles" on Steve Carlson's album "Sharing the Covers" released in September 2012. Hear a sample of Jensen singing "Angeles". The album is available from iTunes or Amazon. Jensen talked about it at his Meet&Greet at the Dallas 2012 con. This interview with Steve is about recording and singing with Jensen. This report with Steve talks about the album and explains why "Angeles" is only available for purchase as part of the album - because credit for that single song would have been reported as belonging to Steve and neither of them thought that was fair. The song was recorded in Vancouver, in the Supernatural ADR (sound recording) van. There is a free YouTube video for the song which was edited by Steve and part of which was recorded by Jared on his iPhone. Jensen says that Steve talked him into doing the video because Steve said 'why don’t we just shoot something, because you know that if we don’t, they’re (the fans) gonna take the song and just compile their own music video on YouTube'. source. It's one of several videos on Steve's YouTube channel. Watch the video of "Angeles" here. Steve's latest album Different Town comes out Nov 5th, 2012. The album notes say Steve wrote the title song with Jensen in Italy. Steve Carlson and Jensen doing a concert at Family Business Beer Company in 2018. Following posts on Instagram of Jensen and Steve in a recording studio, at the Salute to Supernatural Chicago 2019 convention Jensen said that he and Steve had been writing some original music over the past 8 months. in 7.06 Slash Fiction, Dean sings along to the Air Supply song "All out of Love". This sequence in the show was an homage to the scene of Brad Pitt singing Air Supply in “Mr and Mrs Brown”. see the comparison here. Here is an outtake of Jensen singing the whole song from the Season 7 DVD and Blu-Ray. Jensen singing 'Soul Man' with The Impalas.